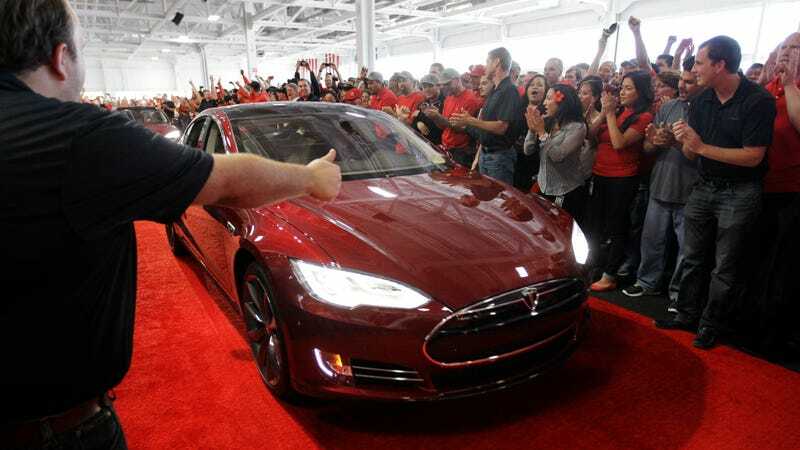 Tesla workers cheer on one the first Tesla Model S cars sold during a rally at the Tesla factory in Fremont, Calif., Friday, June 22, 2012. The first mass-market sedans offered by electric car maker Tesla are now on the road. Back in 2012, the revolutionary Tesla Model S went into production, designed in such a way that much of the software and hardware functionality could be tweaked, fixed or updated remotely. Seven years later, the rest of the industry is just starting to catch up. Tesla had a really good reason to develop remote, over-the-air updates for its cars—it doesn’t have any dealerships and, compared to a traditional dealer network, it doesn’t have many service centers. The ability to tweak ride height, handling, or braking performance on its cars—all updates Tesla has pushed out since 2012—as well as common software patches, was crucial for the Model S to be feasible as a practical car to drive on a daily basis without overloading the Tesla service network. Perhaps the most notable remote perk was Tesla’s move to unlock extended range on software-limited vehicles for owners desperate to get out of the path of Hurricane Irma in 2017. Now, the Wall Street Journal has taken a look at where the rest of the automotive industry is at with remote updates, as most companies are still using comparatively archaic vehicle architecture that requires owners to return to the dealership service center for recalls, hardware adjustments, and even minor software updates. ﻿GM has said it would introduce its first fully updatable vehicle this year and expand the capability across its lineup, likely over the next several years. Ford will offer over-the-air updates on a new electric sport-utility vehicle scheduled to go on sale next year, said Jim Farley, Ford’s president of global markets. And auto supplier Harman International Industries Inc. is working with at least 10 major auto makers to introduce cars that are wirelessly updatable in the coming years, Senior Vice President Oren Betzaleli said. Research firm IHS Markit forecasts global sales of fully updatable vehicles will rise from less than 500,000 last year to 35 million in 2025. According to data from ABI Research via the WSJ article, roughly half of vehicle recalls in North America last year were for software, most of which could likely be fixed remotely on a vehicle engineered from the ground up to do so. ﻿Wireless updates could save on repair costs by allowing both consumers and car companies to avoiding dealership work and improve the rate at which recalled vehicles get fixed, analysts say. Advisory firm ABI Research in a report last year said software-related glitches cost auto makers around $17 billion a year globally. Last fall, GM recalled more than 1 million trucks and SUVs to correct a software glitch that caused a steering defect on some models. GM had customers take their cars to the dealership and then paid technicians to update the software—a cost that likely could have been avoided by a wirelessly transmitted fix, say analysts. A GM spokesman said over-the-air updates can reduce costs but declined to comment on whether it could have been used to fix the steering defect. While the Wall Street Journal points out that Tesla “had the advantage” of designing the Model S from the ground up with remote updates in mind, as well as every model since including the Model X, Model 3 and now the Model Y, that’s a silly excuse for traditional automakers not quickly adapting to feature the same technology. Most major automakers have already developed all new vehicle architectures or modular chassis for their lineups since the introduction of the Model S. The fact that we may still be years away from companies beyond GM and Ford finally catching up is a testament to how stubborn the industry is to technological change. As long as companies account for the cybersecurity risks of permanently connecting their vehicles to the internet, over-the-air updates promise a safe future of streamlined recall fixes, performance tweaks, and any additional bonus unlocks that may totally refresh and redefine our cars.